Millions of neighbors take part in National Night Out across thousands of communities from all 50 states, U.S. territories, Canadian cities, and military bases worldwide on the first Tuesday in August (Texas celebrates on the first Tuesday in October). Neighborhoods host block parties, festivals, parades, cookouts and various other community events with safety demonstrations, seminars, youth events, visits from emergency personnel, exhibits and much, much more. This event has grown from its start in 1984 to involve over 37.8 million people and 16,124 communities from all 50 states, U.S. Territories, Canadian cities, and military bases worldwide, according to the NATW. The National Night Out is a great example of the community coming together to promote crime prevention, police-community partnerships, and neighborhood camaraderie. 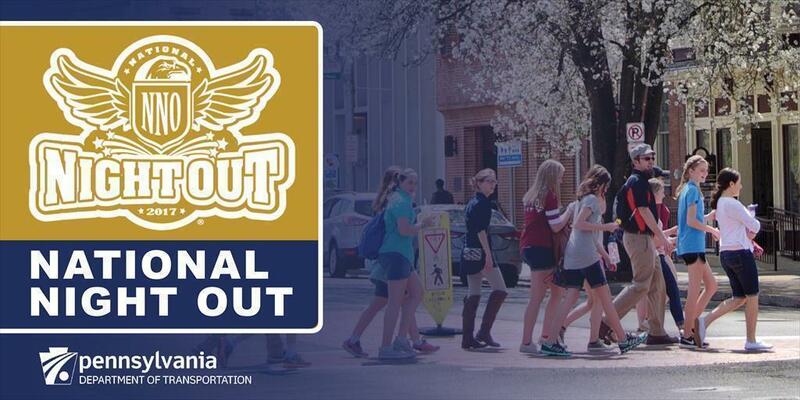 The mission of National Night Out, as well as PennDOT, is to ensure that participants of all ages keep safety in mind. When walking down the street, going for a bicycle ride, or driving in your car, you should feel safe in your own community. PennDOT is committed to continuously improving safety in all modes of transportation. For more information on all safety topics visit www.penndot.gov/safety. For more information on bicycle and pedestrian issues view our YouTube playlist here. To view a list of events in Pennsylvania townships visit https://natw.org/ or read a recent Penn Live article here discussing National Night Out. Join the conversation by using the hashtag #NationalNightOut. Follow PennDOT on Facebook, Twitter, and Instagram.